This database is based on the L'Anguille Valley Memorial Association's reading of December 30, 1940, which was computerized by Sadie Cunningham. Additional information was obtained from various sources including tombstone inscriptions, funeral home records, death records and obituaries. We do not claim that this is a complete listing of every burial, but we have attempted to compile as complete a record as we could. Please send corrections, additions, or obituaries to Debby. This is the church and its sign in September 2006. 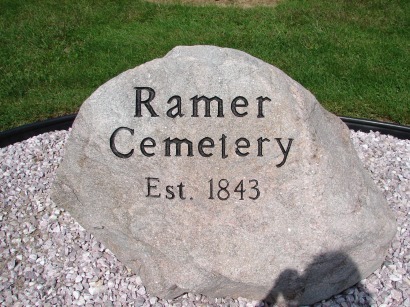 Cemetery is near south edge of S.E.1/4 of S.W.1/4 of S.E.1/4 of section 22, T. 26 N., R.2 E., 2 Indiana P.M., or in the southeastern portion of Washington Township of Cass County, Indiana, and is about 8 ½ miles southeast of Court House at Logansport. 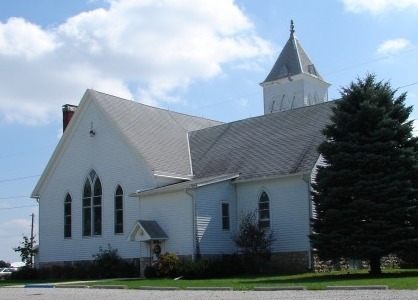 Cemetery is immediately west of Union Presbyterian (Sometimes Called Ramer Union) Church, and is south (and also east) of a stream known as BIG ROCK CREEK, and is North of an East-to-West County Highway which here separates section 22 from section 27. Rev. M.M. Post of Logansport had begun preaching near this point in about 1849; but the first church edifice was not erected here until 1854-5. (Present edifice in 1905. This Report, Completed in January, 1941, is submitted through the L’ANGUILLE VALLEY MEMORIAL ASSOCIATION, 500 FRONT STREET, LOGANSPORT, INDIANA, To the Indiana Historical Society, Indianapolis, Indiana, by Mrs. Jesse G. Martin, R.R.1, Walton, Indiana, with the aid of various other members of the UNION PRESBYTERIAN SUNDAY SCHOOL, whose names appear on the following sheet. Copied and checked by Mrs. Jesse G. Martin, Mrs. Elmer Plank, Misses Crystal and Frances Plank, and Miss Mariam Martin of the Union Presbyterian Sunday School of Walton, Indiana, Rural Route 1 . December 30, 1940.